Earlier this month the first six holes on the North Course redevelopment at Peninsula Kingswood in Frankston were finally ready for member play. The 10th through 15th were officially opened on January 19, and are currently being used as part of a Composite Course alongside 12 holes (1-11 and 18) on the South Course. Planet Golf has played the six-hole loop several times, and previewed some of the other work done on the layout. Above - Par three 14th hole on the new North Course. Firstly a disclaimer; the author is a member of Peninsula Kingswood and an unabashed fan of the North Course. He is also a critic of the South Course, which has certainly improved in conditioning and memorability since reopening, but remains a frustration due to an awkward routing and the lack of interesting ground through parts of the front nine. No such problems exist on the North Course. Ever since the early 2000s, when the then Michael Clayton Golf Course Design team rebuilt the layout, it has been the principal attraction of the Peninsula property. Although funding was limited at the time, Clayton’s company did a tremendous job on that first redesign, particularly in relation to tree removal, improving shot angles and reimagining overgrown green complexes like the 2nd and 14th into true Sandbelt highlights. For a somewhat meagre investment in course improvements, Peninsula saw the North Course jump from outside the Australian Golf Digest Top 100 in 2000 to inside the Top 30 four years later – and rightly so. Not only was the North better regarded externally than the South, the membership used it far more frequently than had previously been the case. 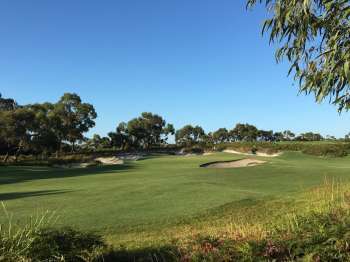 The obvious gains aside, there remained areas of the course still ripe for improvement, and the same issues with turf quality across the Frankston property. Fast-forward to the big money merger between Peninsula and Kingswood, and an opportunity presented itself for the new entity to invest significantly in maintenance and key water infrastructure upgrades alongside course design enhancements. The catch would be that works would need to be undertaken quickly, in order for the club to handover its Dingley land this September to developers. For reasons that remain unclear, the new Board decided to start its redevelopment on the South Course, despite greater structural deficiencies than the North and the fact it required more careful considerations. Beyond firmer, smoother putting surfaces and minor tweaks to the greens that Clayton’s crew couldn’t touch 15 years earlier, it appeared that little needed to be done to elevate the North Course into the upper echelons of Australian golf. That’s not how the design team at what’s now known as OCCM saw things, however. Armed with a generous budget OCCM have rebuilt each of the 36 greens on the Peninsula site as well as virtually all of the bunkering, the tee complexes, pathways, the entire practice area and a meandering rock-strewn creek complete with stone bridges. While the South Course transformation has pleased most within the club, the North Course sits on superior ground to the South and always represented Peninsula Kingswood’s most realistic chance to break into that elusive Australian Golf Digest Top 20. The two bunkerless greens are bunkerless no more, with five traps cut into the putting surface on the short par four 13th and a series of deep bunkers squeezing the previously straightforward 8th. Relocating the 8th green above its naturally narrowing fairway plateau looks the biggest risk taken here by Ogilvy, Clayton, Cocking and Mead (OCCM), given the nature of the now aerial approach shot and how easily the previous par four could have been converted into a classic by pinching its ground-level green a little tighter. Co-designer Mike Clayton has long wanted to put an extended back tee on the 9th hole, and perhaps the change is a result of wanting to better marry those new tees with the previous green. Concerns with the 8th aside, the 12th through 15th remains a stirring stretch of golf and a reminder of why many are drawn to this side of the property over the South. The hog’s-back par four 12th was always a good hole, but the left side bunkering has been enhanced and its skyline green fabulously uncluttered and more appropriately divorced from sand than the previous version. Like the South Course, it is a shame the club hasn’t given golfers more than a two-metre fringe to pitch balls into, although they expect the Wintergreen couch grass to firm up and accommodate bounce shots better over time. Larger and firmer surrounds would also help make the approach into the short 13th more interesting. From a variation on the charming bunkerless 4th at Woodlands, the 13th green is now virtually surrounded by sand shapes that, like at Metropolitan, eat right into the narrow putting surface. Heavy fairway bunkering make it hard to imagine non-Professionals will be tempted to drive toward the green here, but the pitch shot will be memorable for club golfers, and much feared. above - The new short par four 13th green. The next two holes closely resemble their previous versions, with some excellent bunkering and, in the case of the par three 14th, an elegant green complex pushed higher at the back into the base of a sandy ridge. The tee shot on 14 North will be one of the clear highlights at Peninsula Kingswood, along with the ever-fascinating par five 15th, which thankfully retains its crucial left side bunkering at the point the fairway turns back toward the green. Elsewhere on the course, the designers have completely redesigned the previously uninspiring 6th green and added all new bunkering and an elongated waste area to the strong par four 9th. They have also cleared a large area left of the 2nd green to allow for a serious back tee to be placed on the short par five 3rd hole. For fans of the North Course at Peninsula Kingswood the completion of the first six holes is tremendously exciting. Though somewhat surprised at the extent of the design changes made, we were thrilled to see favourite holes like the 12th, 14th and 15th re-emerge from the sand and to finally be able to play the club’s Sandbelt-est holes with firm Sandbelt-like greens. For some the only disappointment with these new holes will be the wait for more to open, and the transition in the meantime back from the North Course loop onto the South.